Mouth of Wonder: What do you do with less-than-perfect fruit? What do you do with less-than-perfect fruit? Lately I have noticed the fruit I have been buying is not so great. No flavor, bad texture, and hard as a rock. I shop in the local supermarket of the people and it seems like the fruit I bring home was harvested a month ago. Sometimes all you need to do is leave it on the counter for a week and magically the flavor emerges, but sometimes it goes from hard to mealy and mushy with no reason. So I have found some recipes to use this sub-par product and make it tasty and delicious. Let's talk about melons. When choosing a melon, use your nose. A melon should smell like a melon and have a little give when you push on the skin. As cantaloupe ripens, the skin starts to dimple a little bit. At that point I usually put it in the fridge. If I don't think I am going to eat it soon I sometimes clean and cube the melon and put it into Ziploc bags in the freezer. Then you take it out of the freezer, let it thaw for 5 minutes, put it into the food processor and whip it till it's smooth. You will have a delicious sorbet-like dessert! Sometimes I add a little fresh mint, lime juice and honey. It's best to then put the mixture back in the freezer for 15 minutes to firm it up, but you also can eat it right out of the Cuisinart container—it feels a little naughty that way! Another cool thing to do with melon is to roast it. I recently read about this at Food52 and I decided to explore some options. They used cantaloupe, but I had Honeydew, so that's what I used. I cut it into cubes and tossed it with cardamon, lime juice, vanilla and some sugar. Then I put it on a parchment-lined sheet pan in a 400 degree oven for 20 minutes. It shrunk a little but when it came out it was sweet and tender and fantastic. Use it in a fresh green salad or in cereal or yogurt. One thing you can do with under-ripe or under-sweet fruit is pickle it. Some of you might have tried the pickled grape recipe from the archives, and now I have found and tried a recipe for pickled strawberries. This is really a quick recipe. First, remove the strawberry tops and slice in half or 3 pieces for the larger strawberries. Place in a large glass container, or multiple smaller glass containers. 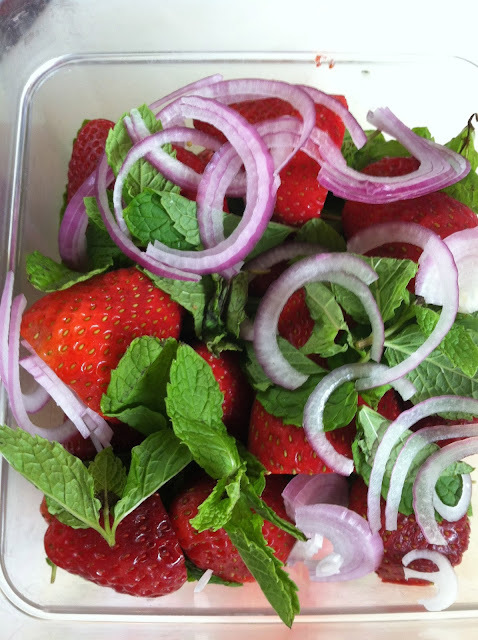 Add the cinnamon sticks, peppercorns and mint to the strawberries. In a saucepan combine the water, vinegar, sugar and vanilla beans (scraped from the pod). Bring to a boil and stir to dissolve the sugar. Remove from heat and pour the hot liquid over the strawberries. Cover and allow this to sit for 4-8 hours in the fridge. You could also process into jars to make them shelf stable. So, what do you do with sub-par fruit? Is it me, or was it a bad fruit year this summer? Stacy, what can I do with my tomatoes? All this rain we've been having is making them crack. Am I doomed to red sauce? It seems a waste of the few home-grown tomatoes I get.